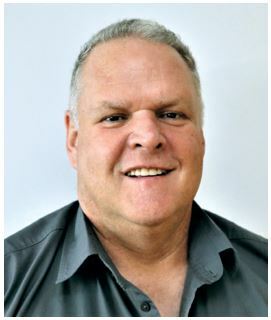 STUART SINGLETON is the dealer principal at CMH Nissan Durban. He is responsible for the motor dealership in its entirety, which includes sales, parts, service and finance and says that his days are often hectic. Singleton has been involved in the motor industry his entire life. He says, "Petrol and diesel run through my veins." From the time that he was in grade eight, he was earning pocket money washing caravans during school holidays for his father's caravan business. His early business career saw him selling caravans in Johannesburg and then he moved on to work under the Hyundai brand. He commented that his eldest brother Sean, who has also followed a career in the motor industry, has been a big inspiration and mentor in both his life and in his professional journey. Singleton joined the CMH Nissan Group 16 years ago and initially started off at the Pinetown dealership. As he lives in Durban North, the opportunity to take over the running of the Durban dealership was convenient and of much value. Significantly, CMH Nissan Durban is now KwaZulu-Natal's largest Nissan dealer and one of Durban's premier car dealerships. Situated in the centre of Durban, the dealership sells more motor vehicles than any other Nissan dealership in the country. "The Durban city node is active and getting better every year. There is also an inner- city renewal programme underway, which is great for the future of this dealership," said Singleton. The city location means that much of the dealership's business is directed to the sale of vehicle, fleet sales, commercial vehicles and their maintenance. The client base includes young first-time buyers who are interested in purchasing used cars. Singleton says, "My success has been driven by my commitment to this brand. I have spent 16 years with the brand and I have developed a love for it." One of the things that he enjoys about working for the CMH Nissan Group is that he is encouraged to be an entrepreneur. "I enjoy getting out there and making things happen. This scope is one of the reasons why I have remained working for as long as I have with this brand." He further explained that the motor industry is absolutely phenomenal. "It is not stagnating, its fast moving and its exciting. His advice for anyone considering entering the industry is that it is a good career with much potential. I look at some of the professional sales guys that we have who are able to make good money and earn themselves a real good living with opportunities to go further." He believes that his success in the industry has been shaped by his personal values, which are based on having respect for other people. "Treat people with respect in everything you do, and you will get results. The most important thing is to be honest, to be straight down the line. It is often the hardest thing to say no but it may be necessary." Singleton looks after a team of about 70 staff members across the various divisions at the dealership. He says that one of the most important things in running the dealership effectively is not only looking after his customers but looking after his staff. "The better I look after my staff, the better they will look after our clients." He added that in order to make things happen you have to be prepared to participate in a give and take scenario. He says that there are currently challenges to the motor industry as disposable income has been negatively affected in the current economic environment. "There are more regulations, such as the National Credit Act and FICA, but these are there to protect people." Singleton has been honoured to win awards as a CMH Nissan Dealer Principle of The Year for three years in 2014, 2016 and again in 2017. These awards, he says, have been unbelievable achievements and of which he is very proud. In the near future, he is looking forward to the availability of new Nissan Intelligent Mobility technologies, which will change the way that we drive as well as shape our expectations of cars. The launch of the new LEAF, which is the second generation of the world's best-selling electric car has also entrenched the growth of the Nissan brand further. When not at work, Singleton enjoys spending time with his family, his wife and children, and enjoys riding his bicycle and playing golf. He recently completed the 2018 aQuellé Tour Durban and is looking forward to participating in other cycling events during the year.